About "How to find the mode of the data"
Mr. David, the owner of a ready made dress shop says that the most popular size of shirts he sells is of size 40 cm. Observe that here also, the owner is concerned about the number of shirts of different sizes sold. He is looking at the shirt size that is sold, the most. The highest occurring event is the sale of size 40 cm. This value is called the mode of the data. 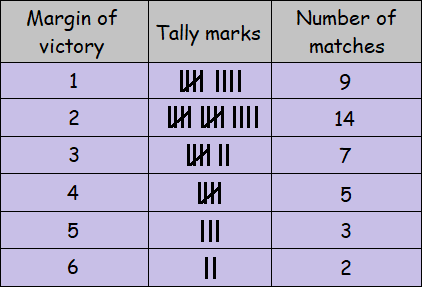 Following are the margin of victory in the foot ball matches of a league. 1, 3, 2, 5, 1, 4, 6, 2, 5, 2, 2, 2, 4, 1, 2, 3, 2, 3, 2, 3, 1, 1, 2, 3, 2, 6, 4, 3, 2, 1, 1, 4, 2, 1, 5, 3, 4, 2, 1, 2. Find the mode of this data. Now we quickly say that ‘2’ is the mode. Since 2 has occurred the more number of times, then the most of the matches have been won with a victory margin of 2 goals. Find the mode of the following data. 2 and 5 occur 3 times. Hence the mode of the data is 2 and 5. Here there are no frequently occurring values. Hence this data has no mode. 12 families have 1 child only, so the mode of the data is 1. After having gone through the stuff given above, we hope that the students would have understood "How to find the mode of the data".